Some of the best recipes I’ve come up with were recipes created from a small budget, an abundance of one ingredient and a lack of time. This recipe is an example of that. Potatoes have to be one of the cheapest groceries you can buy. Potato chips, on the other hand, aren’t so cheap. My calculation reveals that my 10 pound bag of potatoes cost me 29 cents a pound. One potato weighs roughly a half pound. One potato worth of chips per person brings the total per person potato cost to 14 cents each. And you have a cheap snack or side dish that really dresses things up. You can even experiment with other seasonings on top! Trust me, your family and guests will be impressed. Fill a large bowl with water, seasoning salt and vinegar. Wash and slice potatoes to 1/16 inch thick (a mandolin or meat slicer works well) and soak in the vinegar/water mixture for a half hour. Preheat oil in a large skillet to medium heat. Remove potatoes from liquid, strain and lay out on a clean dish towel with another dish towel on top. Line a colander with a few layers of paper towels. Begin frying with just one chip to test how hot the oil is and what the cooking time should be. 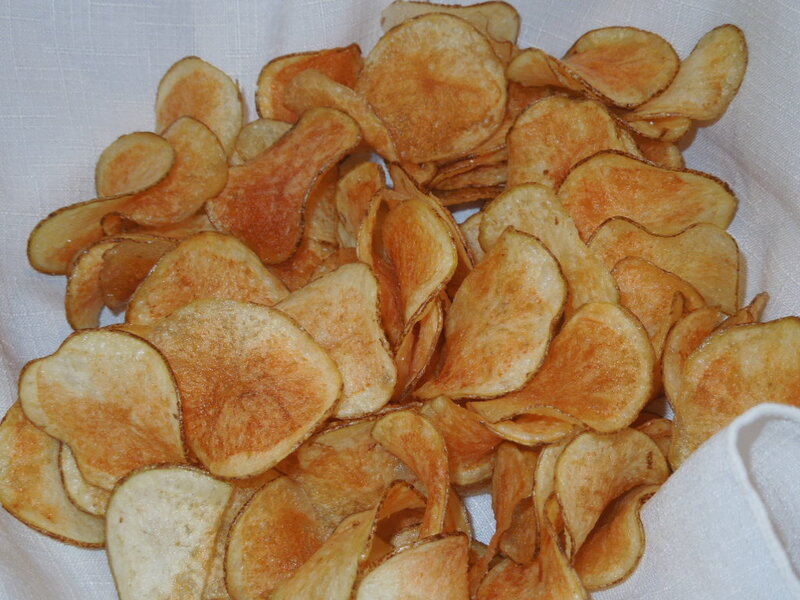 Working in batches, fry potato slices, using a slotted spoon or spider spoon to circulate chips throughout the hot oil. Fry chips 1-2 minutes or until golden. Remove chips from the oil and place in the paper towel-lined colander. Repeat with more batches until done. Note: Be sure to pick up the corners of the paper towel layers and gently toss the chips from time to time so the chips don’t become soggy. Salt as desired. Tags: appetizers, cheap appetizers, cheap party food, cheap potato appetizers, food, fresh potato chips, homemade potato chips, how to fry potato chips at home, making chips at home, making chips in a frying pan, making potato chips at home, potato appetizers, potato chips from scratch, recipes. Bookmark the permalink.